A great Mary Jane is invaluable to my wardrobe. Even better is a colorful Mary Jane that can add a surprising element to my outfits. 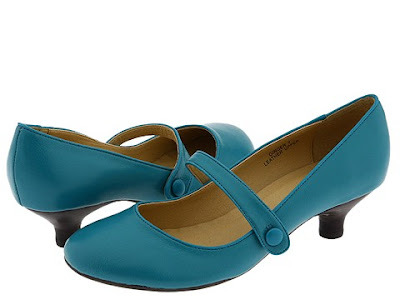 My mom found these Gabriella Rocha Ginger Mary Janes on Zappos and knew they were for me. There are 10 different color/leather options. The turquoise shoes pictured here and the black leather shoes are the only soft leather options. The rest (purple, black patent, bone, brown, brown with camel trim, dark grey, navy, purple, and red) are all patent leather. The stacked 1 3/4 inch heel and padded footbed are perfect for everyday walking. I think they run a half size small, but many of the reviews disagree with me. Zappos shipping is free though so it won't cost you to exchange. For $65, these everyday shoes with a variety of color options are a great buy.